Does Yesterday’s 90-90 Lowry Up Day Change Anything? Yesterday’s +3% snap-back rally was one of the famed Lowry 90%-90% days. For those unfamiliar with the term, these are climactic days coined by a research report by Paul Desmond written in 2002 (you can find the original report in the free trading resource section - in the Articles and Reports section). 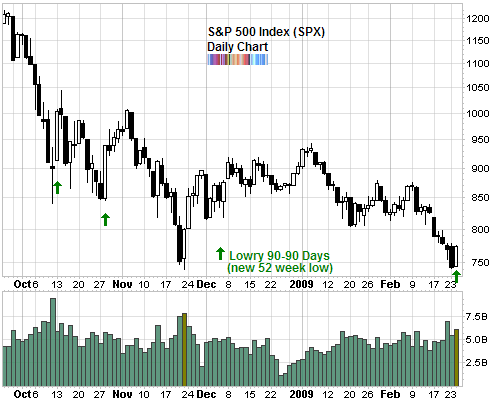 Volume is extreme so that 90% or more is either devoted to downside volume or upside volume. Points are so extreme that they are 90% or more either gained or lost to the downside. These days are significant because historically, every single major shift in the nature of the market has been presaged by the presence of one or several 90-90 down days (representing panic selling) followed by 90-90 up days (panic buying). But before you get excited, consider that for all its glory, the rally was an inside day. That’s hard to believe since it was so powerful. But it still didn’t engulf the previous candlestick. As well, the volume was nothing to write home about. It was higher than the previous session’s but compared to the November low, it came up short. Most of the impetus for the rally came from a massive short covering rally in the financial sector. The Philadelphia Bank Index (BKX) was up almost 14%. For all its significance and predictive qualities, the concept of 90-90 days is just one of the many tools that Lowry Research uses to analyse the market. Their most important indicators are proprietary and measure buying power & selling pressure. According to these indicators, Lowry Research is still advising clients to stay on the sidelines because investors aren’t done selling. Check out my previous in depth report to find out more about Lowry Research and a sample of their analysis of the market (including charts of their proprietary Buying Power and Selling Pressure indicators). We should hit a new low on Friday.